Wainwright & District FCS was created through a partnership between the Province of Alberta and participating municipalities. The FCS Act enables the provincial government to participate with municipalities in the provision of preventative social services. The FCS Act outlines the cost sharing model in which the province provides 80% and the municipalities provide 20% of the funding for FCS. 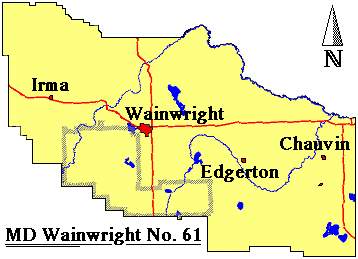 Wainwright & District FCS is a multi-municipal program created by an agreement between the Town of Wainwright, the Municipal District of Wainwright, and the Villages of Chauvin, Edgerton and Irma. For over thirty five years Wainwright & District FCS has provided programs of a preventative nature to the community. Our mission is to increase the quality of life for our community through volunteerism, awareness, information and preventative programming. The FCS Act (RSA 2000 Chapter F-3) provides the framework by which Family and Community Support Services programs operate. The Act outlines what can and cannot be funded by FCS. The intention of the FCS grant is to foster the development of services and programming of a preventative nature. promote and facilitate co-operation and co-ordination with allied service agencies operating within the municipality. Wainwright and District Family and Community Services is a joint venture between the Province of Alberta and the Town of Wainwright, the Municipal District of Wainwright No. 61, and the Villages of Chauvin, Edgerton and Irma. The Board is appointed annually by the Councils of each participating municipality. It comprises of two Town Councillors, two M.D. Councillors and a Council representative from each of the Villages. The Board acts as a policy-making and resource-allocating body and is governed by the Terms and Conditions of the F.C.S. Agreement, as approved by the participating municiplalities. Administrative responsibilities are delegated to the Executive Director hired by and accountable to the Board. Board members are selected from the Municipal councils on an annual basis in either October or November for the following calendar year. Wainwright and District FCS is a member agency of the FCS Association of Alberta. The purpose of the association is to support member agencies and to serve as a link to the provincial Alberta Ministry of Children and Youth Services.